Complete for infinite settings, and with extended, custom Tree-Saver Bands, can extend over huge spans, if desired (not a usual need). 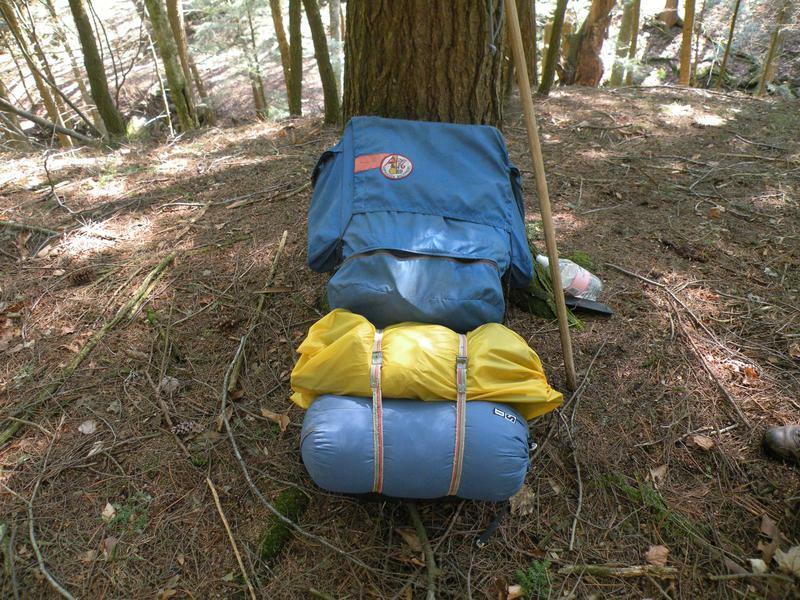 All that's needed for infinite typical woodland stands is in one stuff sack, totaling seven pounds! Add about 15-16 oz. for your choice of a SilNyl Fly, which will fit in the same stuff sack. "Go Camo" for a few ounces more. Our Custom-Cut Fly/Canopy for the Alpha is sold separately so that you can choose from color, grade, and material options. We also build custom units for specific site needs; takes a little longer. You may also buy the Alpha and supply your own Fly, constructing yourself, or buying or modifying from generic Flys on the market. CLICK ON THE RED BOX LINK BELOW FOR A WHOLE PAGE OF FLYS AND ACCESSORIES. With the Custom Fly Canopy over, the Alpha presents a professional outdoor campsite but "goes where no tent has gone (can go) before!" Get away from the crowd; camp where no one would ever think you might be...On slopes, and steeps, across streams and bogs, set high as game watches and blinds, or just for the "sport of tree climbing," etc. 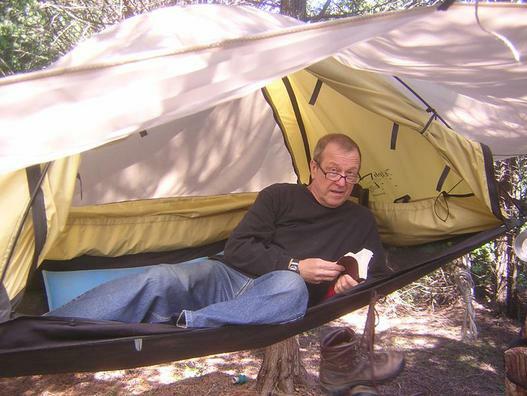 And you are camping in stable, level, bed-like comfort…pretty much anywhere there are trees! The Alpha is constructed of breathable, 2.5 oz. premium ripstop nylon. The overlaying and custom-fit Fly/Canopy provides waterproofing. Breath or humidity condensation pass through the breathable tent to collect on the inside walls of the overlaying Fly/Canopy, there to drip away or be ghosted away by breezes and air flow. Large, trailing edges, "skirts," on the Fly/Canopies hang well beyond the floor level, protecting the floor even when just hanging loose, or they can be gathered under for protection from blowing rain and harsh conditions. 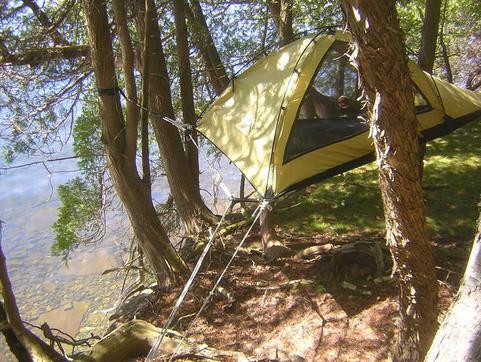 Alternately, in good weather or rain without wind, they can be tied out wide for sunshades and drip awnings, and for a large camping footprint under…and more square footage can be enjoyed too, clear under the tent floor if the Alpha is set to at least sitting height under. You now have a two-storey camp! Rugged, lightweight aluminum, shock corded poles. A double access door with fully zippered, rugged polyester "no-see-um"screen panels in each door panel. The opposite wall has a full picture window of screen, close-able by a zippered panel. A total of 9 zipper heads control air flow and visibility both out and in. A very breathable, thus non-sweating, floor allows great up-through air flow in warm weather and can be sealed off with bedding and insulation pads for cool and cold nights. Two huge pockets are situated under the Headside and along and under the "picture window" opposite the doors. They share a tenionsable shock cord supporting them, too, and the one under the picture window will also collect the ripstop window panel when it is fully zipped down. Other ties surround the exterior perimeter, and with the tensed webs, stainless hardware rings, etc. 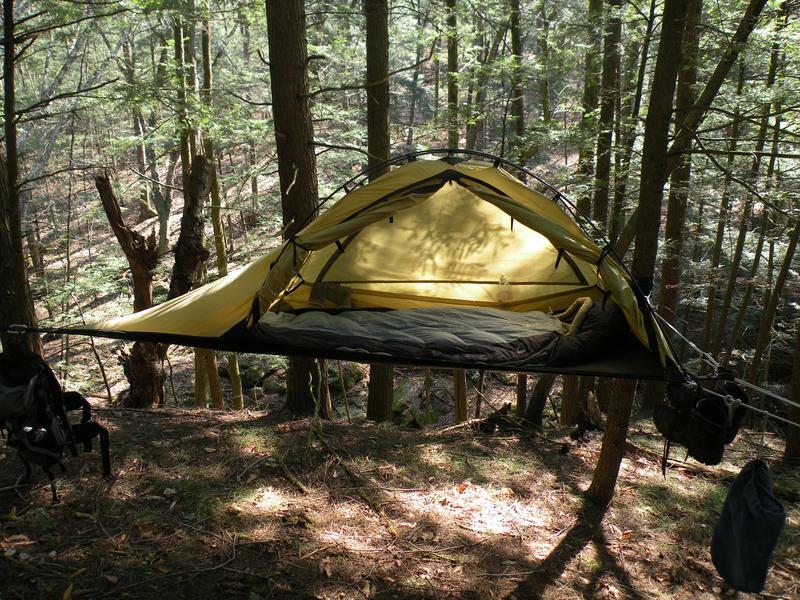 provide plenty of places to hang gear off the ground, dry clothes, etc. with many spots under the Canopy and some runs outside of it too. Over 4400 pound test "spiderweb" of webs and bands integrally supports the Alpha, and it is tensioned by our original 6:1+ ultralight Tensioner, milled and assembled from yachting and mountaineering parts right in our own shops, and equipped with our "elfin cord" lines of long-molecule synthetics with huge load capacities in their 3/16" and 1/4" diameters. OR, you can elect, when ordering, our new, slightly heavier Production Tensioner. It is a little less versatile, but with design changes to our "spiderweb," it will do almost the same job, and without having to learn the one simple knot we teach for the original Tensioner, "The Timber Hitch." Also, we can reduce the overall price by $75.00 if you choose our new Production Tensioner and its web system (which is slightly differently configured--so we need to know at ordering). Accessories include a full floor footprint GearNet for underneath the floor, and a Mosquito Undernet for heavily "bugged" conditions. See our Accessory Page. with new "Production Tensioner" and web modifications. Add back $14.95 to upgrade this Tensioner from Electrogalvanized to Stainless Steel. with our original, in-house milled and assembled ultralight 6:1+ Tensioner from yachting and mountaineering hardware and with our long molecule link "elfin cord." Yes! Just like sitting on the edge of the bed at home! 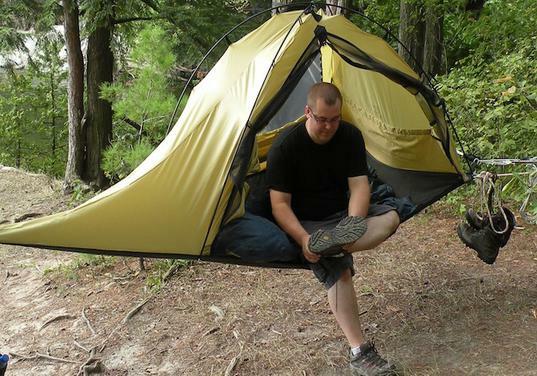 Pulling off camp shoes; hikers tied nearby and will be under the Fly/Canopy, high and dry, with much more dry storage all around after it is deployed over. Tucked in the edge of a forest, with a tiny forest lawn nearby and with Lake Champlain 20' down over a rock cliff. Great views, but invisible to all! All set-up, with boots hanging by door, Fly/Canopy deployed, and ready to relax in stable, level, lounging comfort with some time before camp supper with the proverbial Good Book! Ready for a good night's sleep after fishing the Vermont trout stream down over these forested hills.